Photo by Jennifer Fumiko Cahill Escargot and butter, butter, butter. Photo by Jennifer Fumiko Cahill Hello, Reuben. Or is it Rachel? The French have certainly, as they say, foutent dans la merde, or screwed up hard, over the years (colonization, Polanski, etc.). But when it comes to making the best of tough times, the home of La Résistance is a solid role model. And so French is a fine choice for dinner with a heartbroken friend. In particular, France knows when to throw butter at a problem. Humboldt Bay Bistro (1436 Second St.), which has taken over the bay views and corner nooks of the former Casa Blanca, is turning out some Gallic standards to cut through a pre-winter chill. 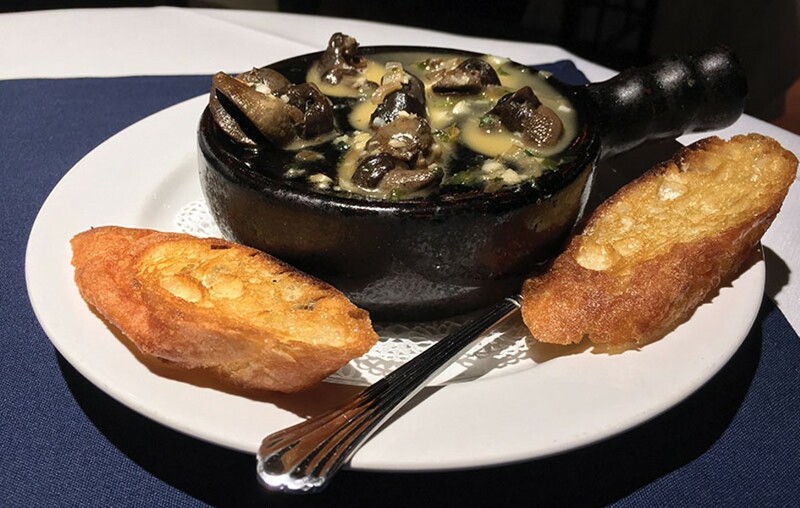 There are little cauldrons of French onion soup bubbled over with gruyere ($6) and escargot ($9) to help you comfort eat more like an attractively teary Catherine Deneuve than you would at home in your sweats. Unlike the draggingly relentless snails that ravage your garden, escargot is hard to find in Humboldt. Here the tender, dark spirals of meat arrive with neither shells nor tongs (whether this is a relief or disappointment to you may be related to whether you're wearing a dry clean-only shirt), swimming in compound butter. Just as the horn section blaring "La Marseillaise" drowns out the singing Nazis in the film Casablanca, so, too, do the little baths of herbed butter, white wine, shallots and garlic push back the chill of a day gone dark too early. Dip the grilled baguette slices in the remaining broth and other clouds hanging over you may recede enough for you to gather your strength and remember that the lights finally came back on in Paris, after all. The famed Carnegie Deli in New York City has announced it will close its doors at the end of 2016, never again to stun tourists and enable regulars with its mountainous signature sandwiches, dizzying stratified cliff faces of corned beef and pastrami. Take a moment to pour out some pickle juice on the ground. How to properly move through the stages of grief from so far away? Luckily Humboldt Smokehouse (310 Fifth St., Eureka) has added to its menu the pastrami the owners have been tinkering with since opening. It's smoked for 24 hours but add in the spicing and curing and you're looking at a 12-day process that yields a deep red, briney, peppery meat that breaks apart with the slightest pull. 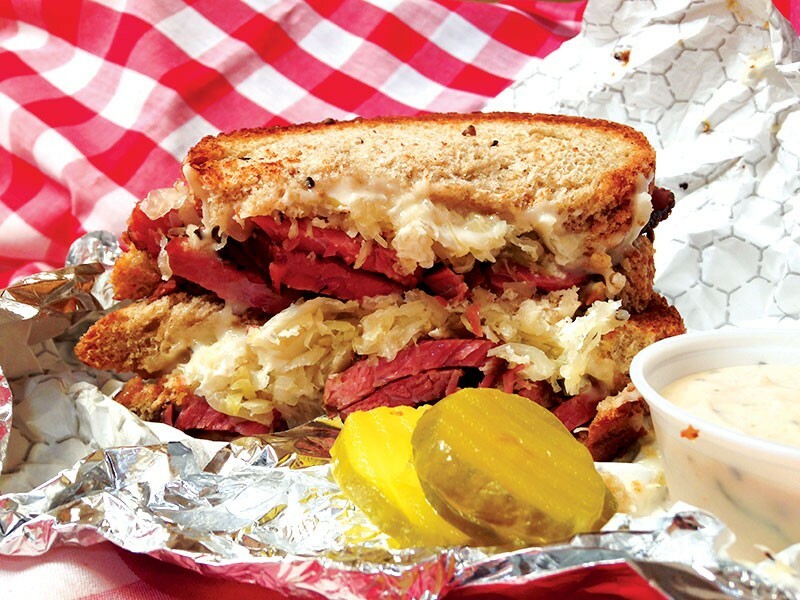 The Reuben ($11.99) is technically a Rachel, the spicier pastrami-filled sibling of the traditional hot corned beef sandwich on rye with Russian dressing, sauerkraut and Swiss cheese. Instead of the infinite layering of thin slices, ¼-inch thick slabs are fanned out on seedy, crusty rye bread with the kraut and cold-smoked Swiss cheese. And technically the relish in the side of dressing takes us into Thousand Island rather than Russian waters, but let's not kvetch when there's a nice hit of horseradish to balance the creamy tang. Worry about having enough napkins. And if you can stand at the counter waiting for your sandwich without ordering a little paper boat of Sriracha and brown sugar bacon (3.99), you're stronger than we are. But less happy. Unlike the hardened brown sugar crusted bacon you want to love but can't because it's lost its warm, fatty charm, these jewel-like chunks of cured pork are equal parts tender and chewy with buttery fat and exactly the right heat to balance the sweetness. And if there's any left by the time your sandwich comes, well, that's a kind of victory, too. Can we get back to that campaign promise/threat? It sounds fantastic. It beats a "chicken in every pot," which leaves you to come up with side dishes. No, life with tacos always in honking distance sounds far better. El Pueblo Market (3600 Broadway, Eureka) has recently extended its empire of pan dulce and chicharones, rolling a slick, chili pepper-mustachioed taco truck into its parking lot. 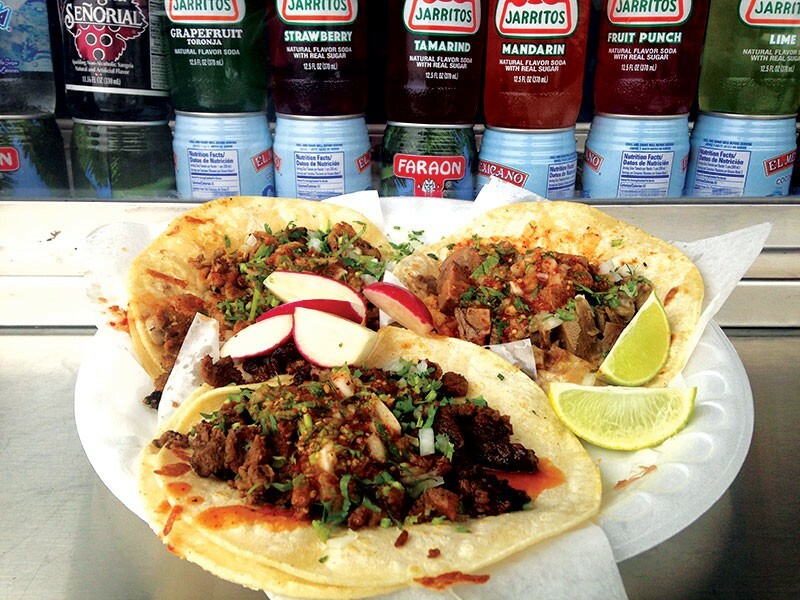 Taco truck romantics — those who wax poetic over weather-worn beaters parked in seedy alleys — may be disoriented by the gleam of stainless steel, the minimalist-chic menu and the shining hubcaps. Take a steadying breath. Smell the meat. For $2.95 each, the tacos are generous mounds of meat topped with requisite onion and cilantro on thick corn tortillas. The lengua comes in soft cubes, but is outshone by the salty char of juicy asada chunks and the buttery curls of tripe. All are splashed with smoky, red salsa and further improved with a tip of the accompanying cup of green salsa. Burritos are available, but the companion who ordered one on the day we visited made quick work of it before photos or samples could be taken. The tight metallic cylinder remains, to the rest of us, a mystery. That, really, is the strongest of recommendations.